It’s almost the end of another year – the perfect time to reflect on the past twelve months and look to the year ahead. In the digital world, 2017 has continued to witness the rise of mobile, prompted by Google’s upcoming Mobile First update. But as we all know, the world of web design and digital marketing is one which is constantly evolving, allowing for new trends to emerge meaning creative agencies such as ourselves need to adapt accordingly. 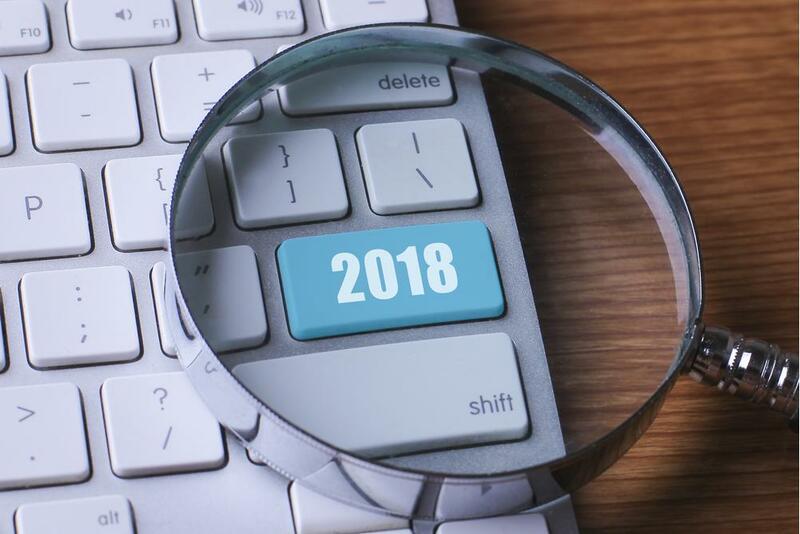 It looks set to be another year of big changes and exciting new developments ahead of us – and while you never can be sure with Google, these are the trends we’re expecting to see in 2018. Far from horror stories and tales of an AI-inspired apocalypse, when it comes to web design, the ever-expanding AI machine is something to be embraced. As technological advances make it ever smarter, machine learning can improve code and processes for greater efficiency. In addition, machine learning can also make it easier for users to quickly find relevant search results in the specific context within which they were searching. Leading to a more personalised, user-friendly experience, AI only looks set to go from strength to strength. In 2018, we can expect many more exciting changes when it comes to AI and machine learning. Another update arriving courtesy of Google, the Quick Answers Box looks set to become much more relevant during the year to come. Following the 2015 Hummingbird update, the search engine’s algorithm was updated to provide more relevant results during dialogue searches. Coupled with the release of Rank Brain, Google is now better at answering specific user questions than ever before. This update looks set to kick-start a gradual shift away from traditional SEO keywords towards answering questions people are asking, putting user experience at the forefront of digital marketing. Do you know about The Internet of Things? This is the concept of greater device connectivity where any device with an on-off switch can be connected to both the internet and each other. From the obvious devices like computers and mobile phones right through to wearable technology, washing machines and even your kettle, this connectivity will create an overarching network of connected devices. On the surface, this might sound like a great idea, helping to increase productivity and efficiency and save time. However, coupled with the rise of the voice control functionality, just how much of your personal data is being retrieved and stored away? One thing’s for sure – technology certainly has a big role yet to play. Spelling the End for Cryptocurrency? Cryptocurrency has always flitted in and out of popularity, but in today’s digital environment, bitcoin is looking set to either rise to great heights or go down in flames. Bitcoin’s price has been climbing ever higher over the past 24 months, but one of the biggest issues is the very fact that it is so difficult to regulate cryptocurrency. For Bitcoin, 2018 seems set to either make or break the currency - but the end result remains to be seen. But as far as our personal predictions go, we think that the security problem will spell the end of Bitcoin. The ever-growing volume, variety and complexity of information; big data is on the cusp of transforming the marketing landscape. Born from today’s digital environment, big data has arrived as a consequence of gathering and storing data related to digital marketing. While the data itself can’t influence digital marketing, it provides the potential to lead to better strategies and more effective campaigns. It allows brands and creative agencies to analyse and develop insights, influencing the decisions that are made. However, big data is still in its infancy, and the real potential of this trend still remains to be seen. That being said, we’re predicting great things for big data up amongst the movers and shakers of modern digital marketing. Conversion rate optimisation (CRO) is nothing new. However, we all know that the digital landscape is constantly evolving, and CRO has to follow suit. CRO is all about staying relevant and ensuring that your website is as user-friendly as possible but former tactics are falling out of favour and paving the way for a new set of strategies in 2018. The future really is wide open for conversion rate optimisation within the digital environment. Everyone has been talking about the rise and growth of mobile for what seems like forever, but with the upcoming Mobile First Google update (more on that later) it looks as though the endless speculation will soon become reality. The race for 5G is another long-awaited concept which is soon ready to hit the mainstream. It’s expected to be rolled out globally around 2020, but here in the UK, the government is committed to being a global leader in 5G. Then, we will be able to take advantage of its potential for increased mobile usability from the very earliest days. Plus, with its arrival, the face of the digital environment is set to change forever. Speculation is rife and we’ve all been talking about it, but rumour has it that the long-awaited mobile first update from Google is highly likely to arrive in 2018. Of course, as with all things Google, we can never pinpoint exactly when it’s going to happen, but the important thing is to be prepared. Put simply, if your website isn’t optimised for mobile, its rankings and authority within the eyes of Google are likely to experience a significant drop. With so many changes and fresh opportunities for growth on the horizon, the world of digital marketing and web design has never been more exciting. Are you looking to get on board with these exciting new trends and make the most of what 2018 has to offer? At i3MEDIA, we pride ourselves on being an industry-leading creative agency, delivering innovative, top-quality SEO and web design services in Peterborough and beyond. Interested in hearing more? Drop us a call on 01733 890836 or pop in for a chat with a member of the team.